Donald Trump and Vladimir Putin meet: Could war with Russia be imminent? 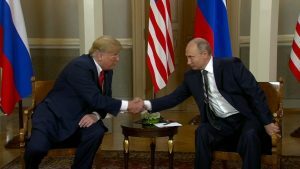 Despite criticism from the USA press and various political opponents, US President Donald Trump met with Russian President Vladimir Putin in Helsinki, Finland today. The two met privately with only their interpreters for two hours, before then having a late lunch meeting together being joined by their respective advisors. President of Russia Vladimir Putin: Mr President, I am delighted to meet with you here, in Helsinki, the capital of hospitable Finland. We have maintained regular contact. Over the past few months, we have talked on the phone and also met several times at various international events. Of course, the time has come to hold in-depth discussions on bilateral relations and global problems, the number of which shows that we must devote our attention to them. (In English.) Thank you very much. President of the United States of America Donald Trump: First of all, Mr President, I would like to congratulate you on a really great World Cup, one of the best ever, from what everybody tells me, one of the best ever, and also for your team itself doing so well. I watched quite a bit. In the United States we call it soccer, and I watched quite a bit of it. And I watched the entire final, and the semi-finals, and they were really spectacular games, and it was beautifully done. So congratulations, on that. Most importantly, we have a lot of good things to talk about, and things to talk about. We have discussions on everything from trade to military, to missiles, to nuclear, to China. We will be talking a little bit about China, our mutual friend President Xi. HELSINKI (AP) — President Donald Trump and Russia’s Vladimir Putin opened their long-awaited summit Monday … then talked one on one behind closed doors for two-plus hours before the American leader declared their meeting was off to a “very, very good start for everybody.” … their private meeting in the opulent Gothic Hall was under way. Just the two of them, each with a translator. Yes, as President Trump said, the USA and Russia have massive nuclear arsenals. But will they be used against each other? Is a massive war with Russia imminent? “Gog” Identified“Gog in the land of “Magog” is the vast regions of the U.S.S.R. in northern Eurasia extending from the Baltic to the Pacific. “Meshech” is Moscow, “Tubal” is Tobol’sk.Notice the allies who come with them in this future battle. You will find “Gomer” “Togarmah,” “Magog,” “Meshech” “Tubal” identified in Genesis 10 as the sons of Japheth, father of the Eurasians. Ethiopia and Phut (mistranslated Libya) are descended from Ham. Russia and the USA are not about to go to a massive ‘hot’ war. Let me add Ezekiel 38 is for the distant future–and right at/after the millennium (cf. Revelation 20:7-9; see also Ezekiel 38: For Russia & Iran in Our Day? ; a related video is also available titled Ezekiel 38: For Russia, Ukraine, & Iran Now?). But, I do believe that Russia will wish to cooperate with Europe to assist in ending the existence of the USA. I believe it may well end up with Alaska, as well as parts of Canada (see Russia and Ukraine: Their Origins and Prophesied Future and Will the Anglo-Nations be Divided?). However, as various prophetic matters have not happened (for details, check out the article When Will the Great Tribulation Begin? ), it is fair to say that the USA will remain a nation until sometime AFTER the first term of Donald Trump’s presidency. President Donald Trump says he spent a “great deal of time” addressing Russian meddling in the U.S. election during talks with Russian President Vladimir Putin in Helsinki but he wouldn’t directly criticize his Russian counterpart over the issue. “During today’s meeting I addressed the issue of Russian interference in our elections. I felt this was a message best delivered in person,”Trump told reporters during joint news conference with the Russian leader. Republicans and Democrats alike are dismayed by President Trump’s comments at his joint press conference with Russian leader Vladimir Putin on Monday. Mr. Trump stunned onlookers by repeatedly defending Putin during the press conference from allegations that Russia interfered in the 2016 election and casting doubt on conclusions to that effect made by U.S. intelligence agencies. Ari Fleischer, a Republican and prominent Trump defender who served as former President George W. Bush’s press secretary, said that while he still does not believe Mr. Trump colluded with Russia in the 2016 elections, he understands now why people think he’s being blackmailed. The USA is more and more a house divided–which is not good (Matthew 12:25). Donald Trump is a factor (though not the only one) in this division. This entry was posted on Monday, July 16th, 2018 at 7:00 am	and is filed under Prophecy.